A Liberal's Libretto: OPERA NEWS incites dialogue on the bland and generic future of opera. OPERA NEWS incites dialogue on the bland and generic future of opera. I know. I'm kind of shocked, too. The August issue of OPERA NEWS has sparked debate about the future of opera. A word has been thrust onto the political stage over the last few years. The word is, optics. Look up the word optics in a dictionary, and you're likely to find a very scientific definition along the lines of 'the study of light and vision'. Put in the context of a politician or political campaign, optics refers to the way a situation is perceived by the general public ... as in: how an event, course of action, etc. looks to the general public. Generally when I see the cover of OPERA NEWS upon its arrival, I can tend to be a little critical if the image isn't good. (I've been concentrating like crazy on images lately.) I'd be lying if I denied the fact that sometimes I do wonder quite out loud: "Who is in charge of picking these damned cover photos"? 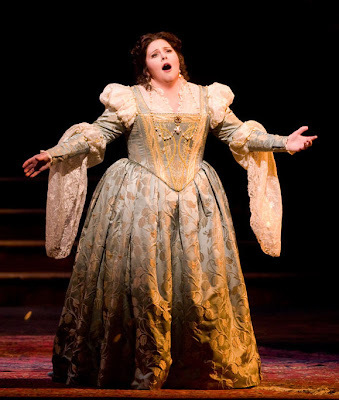 There was one in particular in which a female opera singer was wearing a summery sun-dress, under which, she clearly could have benefited from a well fitting undergarment. All truth. Go ahead: hashtag it. 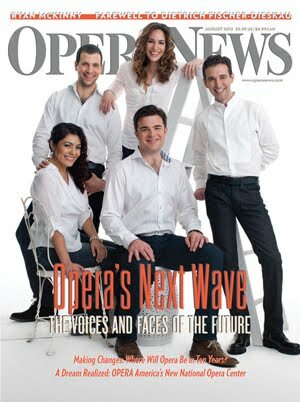 August's issue of OPERA NEWS highlighting Opera's Next Wave - The Voices and Faces of the Future might take the critical-cake for me, though. On the cover [upper right], we see soprano Ailyn Perez, bass baritone Luca Pisaroni, mezzo-soprano Kate Lindsey, conductor Michael Christie and countertenor Anthony Roth Costanzo, seated or standing in various positions, all looking quite happy and jovial against a white backdrop. The photo itself, taken by James Salzano, isn't all that bad - but, to be honest, it looks more like a high school dance photo than it does a magazine cover. Now, let me be perfectly clear, I have no doubt whatsoever that these folks will contribute to the future of opera. So too will the many folks who are not featured on the cover but are featured inside the magazine: sopranos Angela Meade [R.], Amber Wagner and Latonia Moore, mezzo-soprano Isabel Leonard, composer Nico Muhly, conductor Anne Manson and the like. This issue of OPERA NEWS takes a look at some of the people we feel will be increasingly important during opera's next decade. The list of names that we have chosen isn't meant to be exhaustive or all-inclusive; in a field as well stocked with talent as opera, there were literally scores of possibilities for this issue. We chose to concentrate on individuals whose artistic and professional progress had caught our attention in the past few seasons - and whose exceptional talent, ambition and energy have allowed them to thrive in a field that will always be rich in challenges. These are men and women who have come a long way in the past decade: for example, in 2002, the majority of the singers featured in this issue had not yet made their professional debuts. But, back to optics - or how an event, course of action, etc. looks to the general public. OPERA NEWS has stated that the question of how to attract new audiences to a seemingly "old" art form is one that needs to be answered urgently, as consumers today are bombarded with a mind-boggling array of entertainment options. And, the Met in particular, has spent quite a lot of time and money trying to re-brand opera ... making it appear to be more accessible. Not only by physically making it accessible through its Live in HD and On Demand programs but, also by making the productions themselves "look" more "mainstream". And now, here we have what is undoubtedly opera's premiere news magazine - published by the Met's Opera Guild, NOT the Metropolitan Opera - discussing the key players in the future of opera. On the cover of the issue, we see the future of opera in dark jeans and white shirts against a white background ... plain, vanilla, stark, barren and, quite frankly, vapid. THIS is the future of OPERA? Generic, void, cold, bland and characterless? Say it ain't so! Or is it? Since the issue went into circulation many have cussed and discussed the future of opera. ... But until opera stops being associated with escapist nostalgia [Woolfe speaks specifically of movies like Moonstruck and Pretty Woman.] and fancy dates, it is doomed to struggle for relevance. ...I say I’d like to see more focus on the music — not just in such discussions, but from those who are casting and conceiving of opera seasons for the coming years. ...Meade has the vocal chops, and she also seems like an appealing personality, but in trying to shoehorn herself into a serious tragic-heroine mode in “Ernani,” she squeezed the personality, and consequently some of the thrill, right out. I hope she figures out how to insert more of herself into her dramatic performances, because ultimately, the future of opera rests precisely on the vocal presences and vocal personalities that get audiences excited and make them want to come. This quality of persona has always been a part of what makes opera exciting. And you can’t always predict who will develop it. Take Luciano Pavarotti. At the start of his career, he wasn’t, by all accounts, anything special to watch on stage at all. He developed into something of a stage animal, with a legendary magnetism. He certainly luxuriated in the music he was singing. But he was never much of an actor. This is what I meant about Angela Meade; and this is an aspect of the operatic art that I think tends to get lost today in training that focuses on all of the individual elements of opera -- singing, diction, language, and, yes, acting -- but not enough on what it takes to get out there and dazzle an audience. Indeed, the OPERA NEWS snippet on Angela Meade - which was then tweeted from @OPERANEWS - doesn't shy away from pointing out quite vividly that Angela Meade is an opera SINGER not an opera PERFORMER: "she has become a kind of heroine for opera-lovers who place vocal standards well above theatrical ones." NPR also got into the fun by using the OPERA NEWS cover story as a jumping off point for the discussion Is Opera Ailing? A Conversation About The State Of The Art. You'll have to check that one out on your own so I can get to my point. No one is going to agree on what the future of the art is. But, I have contended here before that ultimately, it appears that the fundamentals of the opera world are changing - not necessarily for the better. And, I think it's key that we have to understand why that is before we can settle on what the future holds. Opera is a big art form which requires big voices, big gestures and big personalities. It has always been centered around the voice and around making a sound big enough to cut over the orchestra and to fill a house without amplification. In addition, gestures and movements have traditionally been very big in order for those seated at the back of the house to be able to see what's going on. But at this point in time, some people are trying to change that ... they're trying to fit a grandiose package into a small, very confining space. In fact, I think Zachary Woolfe was onto something... but, perhaps it's not the movies that are the problem - it's the movie screen. I'm sure you've read about when the movie business transitioned from silent pictures to "talkies". The actors and actresses had to transition they way they acted from overly theatrically-big gestures and facial expressions (which compensated for the lack of spoken word) to a much more subdued way of acting. Today, opera singers who appear on the HD screen are having to do the same. A gesture that would be used during a performance in order for the people in the back of the house to see it, will have to be toned down when the HD cameras are running. And what's more is that the facial expressions that we singers make from time to time in order to produce the sound needed to fill the house, also have to be toned down. I see it akin to putting a beautiful butterfly into a jar so you can look at it. Not only will the butterfly die sooner - but, part of what makes a butterfly beautiful is seeing it flit about. I'm suddenly reminded of a tweet I saw in which a singer had asked her father how he like the HD Broadcast he saw that day. Her father's response was something akin to "I really liked it because they didn't look like they were singing.... they looked like real people." Whether in HD Broadcasts or perhaps in the Movies too, I think putting opera in the movie theaters is skewing the desires of opera's true audience - in a purely psychological manner. When we go to a movie at the local movie house, we see perfectly made-up, perfectly dressed, perfectly sculpted, perfectly scripted, high-budget movies starring the Hollywood-ideal of men and women. So, it also stands to be true that when we go to the local movie house again, but this time to watch Tristan und Isolde, Lucia di Lammermoor, Tosca or even La Boheme - we can’t help but assume that since we’re sitting in the comfortable seats with our nachos, popcorn and silo of Diet Pepsi, that the people on the screen will look just like they do in a Hollywood movie. It might be over simplified ... but, remember Pavlov and his dog? I think they were onto something there. 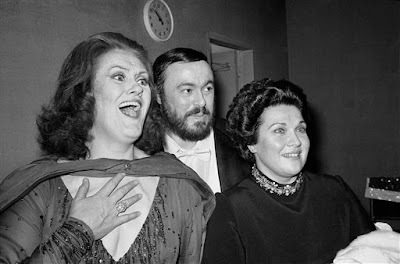 Legends Joan Sutherland, Luciano Pavarotti and Marilyn Horne. I’m afraid that the days are numbered for opera singers who are magnetic on stage and sing the hell out of a role, but don’t have the Hollywood looks. It makes me wonder: would singers like Caballe, Sutherland, Horne, Norman, London or even Pavarotti have ever had a chance in this day and age? They were all beautiful in their own way, but certainly didn’t fit a “mold”. It seems that as soon as opera was put on the HD screen, it was assumed that audiences were no longer smart enough to employ the suspension of disbelief. Remember when a singer was cast to sing a role because he or she would truly be remarkable doing so? 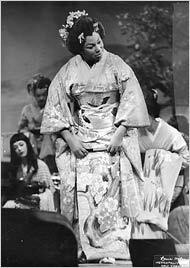 They may not have even "looked the part" but, the voice carried the performance ... As in when African-American soprano - and legend - Leontyne Price sang the role of a Japanese Geisha Cio-Cio-San. Stunning. I believe that beyond the gestures and what people are accustomed to seeing in a movie theater, the movie screens are contributing to a larger problem. I think that opera is on the road to Bland-ville. And interestingly enough, the OPERA NEWS cover illustrated my point rather well. Opera is on a path where emphasis is no longer about the singing, what makes opera unique or what makes opera the grand art form that it is (or was). Instead, a great deal of focus is being placed with laser-like precision on people looking like a Hollywood star. Or, at least "looking the part" ... however bland that might be. All so the-powers-that-be can fool themselves into thinking that opera is becoming more "mainstream" - which, it's not ... nor should it. What we do as opera singers is far from "mainstream". What we do is different. Opera is huge, loud, colorful, awe-inspiring, distinctive, incomparable and let's be honest ... a little abnormal. Perhaps they we should be celebrating what sets opera apart from everything else out there and should be educating people about what makes it unique, grand and marvelous ... as opposed to forcing opera into a teeny-tiny space. Dumbing opera down, making opera more bland, making opera more "mainstream", shoving opera into a small box, simply cannot be the long term future of opera. It simply cannot. Opera deserves better. And, to be perfectly honest, audiences deserve to be given more credit. Instead of dumbing opera down because some assume general audiences wont get it... we must educate them. Instead of making opera more bland because some are afraid the spectacle will drive them away, we must let it be grand and give them the opportunity to fall in love with it. If we don't, we are enticing an entire generation of audiences to fall in love with something that is not true opera. "When you don't show up as who you are, people fall in love with who you're not. Then when they find out who you are, that's when they leave." Well said, and very true. Although I understand the original intention of the Met and others in bringing opera to the movie screen, I do believe that it has gone off on a tangent. The original idea was to make opera available to people where there may not be local companies and where real performance is scarce. Or perhaps to those like me, who would like to see something other than the usual local repetoire. However, somewhere along the way, it became too Hollywood, too much about putting butts in the movie theater rather than educating and cultivating new opera devotees. Opera has always been, and should always be, about the music. Amen! A great discussion. HD may have a part to play but it's just one part of the opera jigsaw and can never replace the experience of seeing opera, or theatre, for that matter (also now being broadcast in movie theatres)live. And it's nonsensical to expect singers not to be straining at least a bit when they're singing over a full orchestra. There needs to be exciting, innovative productions staged with the right voices for the roles, not singers who simply look the part. It's Hollywoodisation, and it's not a good development. I think the whole attitude of filming an opera is wrong. Put the camera in the front row and leave it there, or as far back as necessary to encompass the whole proscenium. When you close-up on a face or even on a full figure, you're missing something everyone else in the theater sees: what the other characters are doing. I have the same problem with filmed ballet, where they insist on isolating one dancer or even one dancer's face. There's something of the same thing that happens in filmed sports. Directors love close-ups, and to be able to pick from various camera angles; but in doing so they deprive us of the experience of the sport, or the ballet or the opera. Let stage performances be what they are, which is NOT a movie. And Amen Amen I say to you, if you do not know the truth of Opera you do not know Opera.